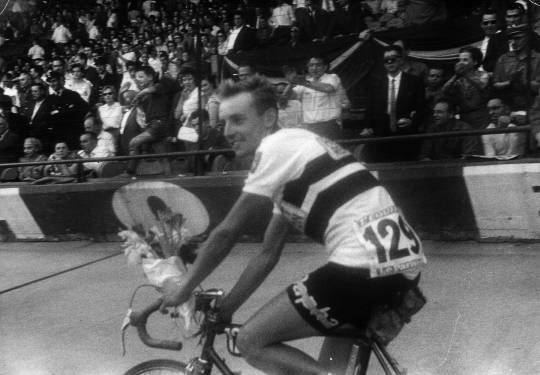 Charly Gaul and Federico Bahamontes are regarded as the greatest climbers in the history of professional cycling, but they faced competition from an entirely unexpected source at the 1959 Tour de France – a skinny 23-yr-old from South Yorkshire called Victor Sutton*. I have been contacted by Vic Sutton’s widow Shirley, who would like to describe Vic’s cycling career for those who know little about his cycling exploits, and for those of us who enjoy a little trip down memory lane now and again. Here is a collection of information and images gathered by Shirley and posted on the website for posterity, to mark the Tour de France’s visit to Yorkshire in 2014, and the connections of this county and her riders to the great event. “Victor Sutton was one of the revelations of the Tour. For a long time in the early stages he was near the tail of the field, like Hewson and Andrews not in the best of health. Then in the mountains he came into his own. He has got that mysterious “something” that he was born with – the ability to climb the big mountains. 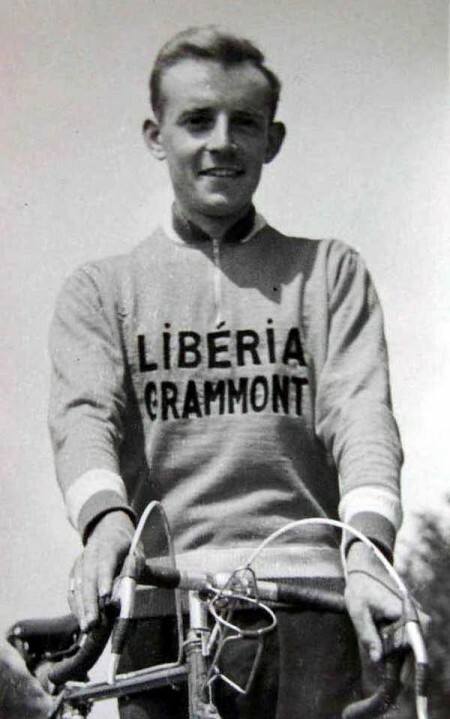 He also rode in the Tour in 1960, but collapsed on the 17th Stage and was taken by air ambulance to Thonon les Bains hospital, where he spent 10 days recovering. He would have been so proud to think that British rider could win the Tour de France and to come to Yorkshire was unthinkable in 1959 or 1960. ( * Originally published on letour.yorkshire.com/local-cycling-heroes). 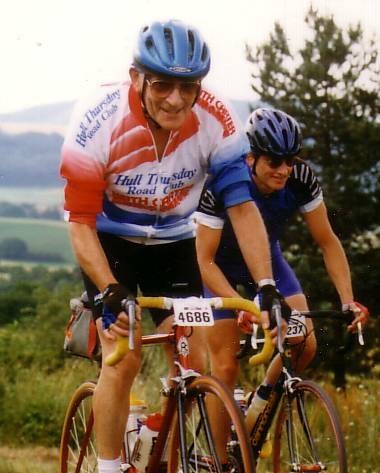 Victor Sutton died at Little Weighton riding the Road Race League. He was a member of Hull Thursday Road Club. Vic is mentioned in the Tour de France local heroes web site. Information supplied by Shirley Sutton via email on 8th May and 9th September 2014, to Hull Thursday Road Club’s website editor. “If any proof was needed of how precious life is, my mother had been cycling to and from the gym a only few weeks ago at the age of 70 and there she was, soon after, in hospital fighting cancer. I would like to share this unusual story. I was at the hospital in my cycling gear one evening, with my sister, when I was telling my mother about how Lance Armstrong came back to win 5 Tours de France, which started her talking about the cyclists of her day and the good age that they lived to. “Do you remember Vic Sutton?” she said. The name was strangely familiar, but from where I didn’t know. “He had that jeweller’s shop in Cottingham village”. (1) After finding out where it used to be (it’s now an estate agent’s) (2), I realised that back in 1971 (3), Vic Sutton had replaced the battery in my Bulova electronic tuning fork watch that used to be advertised on the pirate ship Radio North Sea International. I could just about dredge up a few grainy memories of the middle aged man who served me over 30 years ago. This was Vic Sutton apparently. “Setting off into the night and after having been in that place, feeling extra lucky to be able to do so, the name of Vic Sutton was still on my mind. I’d heard that name recently, but where? “Gradually the vague memory of reading about him started to surface. I was convinced I’d read about him in a magazine. I don’t really save them as such, but I throw them into the garage loft space after reading them. “Fishing around later that week with a small torch, I found it. The profile of a rider who finished in the top 40 of the Tour de France, living down the road! (1) We did not start our Jewellery shop until 1977 (Simon said 1971). (2) The shop is not an estate agent’s. The one opposite the garage in Northgate was an off-licence shop, and we opened a jewellery department (our front room) in 1977 after the Queen’s Silver Jubilee, when everyone was wearing silver ingots (we displayed them amongst the sweet jars on the shelf on the wall behind the till area to start with). Now, in 2014, it is a dentist’s. (3) We went to Finkle Street in Cottingham to open a new shop (newly built) in 1982 and that one is still there under the name of Guest and Phillips. Tony Hewson, John Andrews and Vic Sutton pose with local supporters. Reimes 1958. Vic Sutton leads Jacques Anquetil, Roger Riviere and Charley Gaul on the Tourmalet. 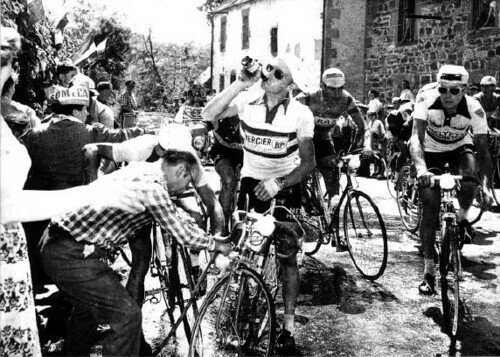 Vic (on the right) seeks to refill his bidons in the 1959 Tour. Vic’s finest hour. Taking a lap of honour on the Parc des Princes track in 1959. 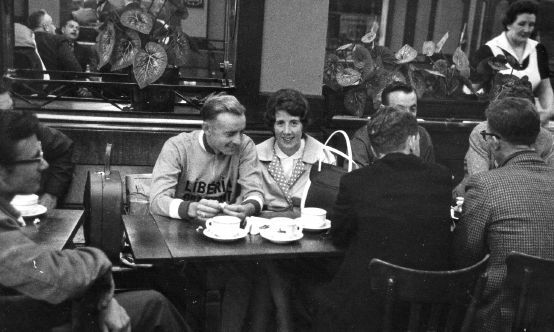 Vic Sutton meets up with his wife to be Shirley before the start of the Tour in 1960. 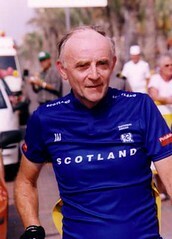 Vic at the 1995 European Seniors RR cup on Mallorca. Vic Sutton riding l’Etape du Tour in 1999. More information on Vic’s life and career in cycling from Howard Peel, whose website this was lifted from no longer exists. Most British cyclists, if asked to name a British rider who not only rode the Tour de France but was able to climb with the best of the Continental stars, would probably answer ‘Robert Miller’. However, if pressed further and asked for the name of an English ‘grimpeur’ who was a compatriot of Coppi, Anquetil and Bahamontes it is likely that they would be stumped. That rider was Victor Sutton, a revelation of the 1959 Tour de France, a race he completed in 37th place, 2 places higher then Chris Boardman’s best performance. Further, Vic Sutton was a true pioneer, being only the 4th British rider to complete the Tour. Even more remarkably Vic Sutton did not break into the world of Continental racing with the support of a professional team, instead he simply left his home in Doncaster, travelling in a converted ambulance along with fellow adventurers Tony Hewson and John ‘Jock’ Andrews and raced against the best as an ‘Independent’. Born on 3rd December 1935 at Thorne, near Doncaster, Vic was actually christened Herbert Victor Sutton, the name Victor coming to the fore in order to avoid confusion with his father who was also called Herbert. He was not raised in a cycling family but in 1949, at the age of 14, he became a member of Thorn Paragon CC. Vic showed early racing promise riding Thorn Paragon CC’s Christmas Day 10 in 1949 in 30 minutes and 4 seconds, an unseasonably fast time, especially for the era. What’s more this was his first ever race! His enthusiasm for cycling was unbounded and he almost never missed the weekend club run. Indeed, in 1952 he rode with the club 51 times out of a possible 52 to win the clubs attendance trophy, a trophy he was also to win the following year. After leaving school Vic worked in the shipyards at Thorne and then saw 2 years National Service in the Royal Airforce. 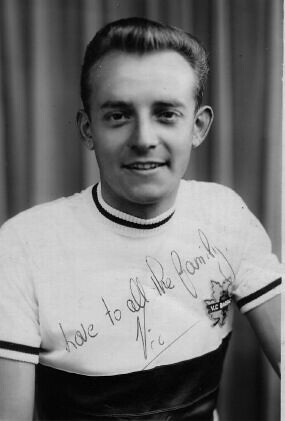 After being a ‘clubman’ for a couple of years Vic started racing in earnest and soon started to win open time trials and road races. These wins included the 1956 Alpha Two-Day road race from Beverley to Whitby and back, an event that was later to become the Zerny two day and is now run as the East Riding of Yorkshire Classic. In 1957 Vic came third in the National Hill Climb Championship, a race held in the Peak District and was won by Tom Simpson. Vic also came 22nd in the 100 mile Senior Amateur Road Race Championships, organised by the British League of Racing Cyclists. Then in 1957 Vic spent July in Belgium enjoying a racing ‘holiday’ and staying at Albert Bueuricks ‘Cafe den Engel’. Whilst there he gained a number of good results including a second place. These results fired his imagination and he began to wonder just how far he could go. Promising as Vic’s performances were few could have predicted that in less then 2 years Vic would be handing out the punishment to riders of the calibre of Jacques Anqueteil, 5 times Tour de France Winner, on the mountain passes of the Tour. The key to this rise in fortune was Vic’s decisIndependents’ sponsored by Fred Dean Cycles of Wandsworth and taking on the Continental pro’s from the ‘comfort’ of a converted ambulance! This was no easy life as the following extract from ‘Cycling’ of 18 March 1959 shows. ‘I woke with a start and turned over in my bunk. I was frozen stiff. The February wind was blowing snow flakes through the open windows of the ambulance. I staggered up and slammed them shut. “Idiots! Do you want us to freeze to death?” But the other snoring figures paid no heed to my words. It was cold. We were in Flanders. It was ice cold. The story really begins a month before this in January 1958. Vic Sutton, Jock Andrews and I, Tony Hewson, three young men with little money and less experience but with one burning purpose, to seek adventure, to escape the humdrum life of the office or factory, to earn a living by bike racing on the continent. 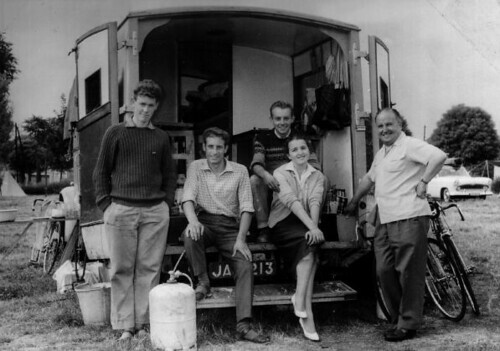 We had experienced continental hotel bills previously – a caravan and a car would have been ideal but were still outside our means, so it had to be an ambulance converted to what we required as cheaply as possible. We bought her at a breakers yard near Chesterfield. She was pretty near what we wanted and the price was right; she was a three tone Austin twenty six horse-power, built for desert warfare… Out went the stretchers and in went four folding bunks and a table. Vic did the joinery, Jock made the mattresses. I was clerk of works. THREE WEEKS’ BOARD AND LODGING! As an ‘unknown’ Sutton was the sensation of the 1959 Tour de France, finishing 37th at his first attempt and climbing like a new ‘Angel of the Mountains’. Since resuming publication several readers have asked if we “have ever heard of Sutton”. Here is the answer! We obtained his exclusive story immediately after the Tour de France finished, but sheer pressure on space has meant keeping the feature until today. You will, we trust, find the wait well worthwhile. REST day at Bayonne! I’ll not forget it, for I suppose it was the turning point for in my first ever Tour de France. Everyone starts the race knowing that it’s going to be hard, but for me it seemed to be that much harder – a head cold was really at the root of the trouble. I was going all right when I started with the rest of the 120 field from Mulhouse even with the cold, but then I crashed on wet cobbles at Nancy, 60km. from the finish – it was pretty bad, as Shay Elliott came down in the same place – and I ended up well down with cuts on my left elbow, knees, and a mammoth bruise on my left thigh. I had the same sort of luck the next day when, “flying,” I punctured twice in the last 30 kilometres on dusty paths of roads. Gradually the head cold got worse until after four days I had a sort of sinus trouble which affected my breathing. This lasted until the near-coast town of Bayonne and, as you will remember, I was then 109th overall, second from last, and 49 minutes 9 seconds down. That 207 km. into Bayonne was the hardest day of the Tour for me. I normally prefer wet to real heat and that day it was really hot, sapping my strength – made worse by the breathing trouble. For 207 km. I hung on desperately. But after that rest on July 4, by which time my friend, team mate and living companion Tony Hewson had been forced to drop out with bronchitis, my cold went, my head cleared, and with the increase in all-round fitness that came as my health improved so I gained more confidence. The first mountain stage lay ahead ! When the race started I treated each day as it came with no real plan, other than the hope of getting to the mountains OK. Stage 10 saw the 6,973 feet climb of the Tourmalet. The field was split into about a dozen groups and I jumped from one to the other until I reached the leaders (Brian Robinson tells me that Vic rode alongside him in the leading group on that climb, said, ” Right, I’m going to show these…! They’ve given me the hammer on the flat so now I’m going to show them.” And he did! – Ed.). But I lost a lot of ground on the descent and finished 35th. Stage 14 from Aurillac to Clermont Ferrand was the day Brian Robinson and Shay Elliott finished outside the time limit and I was 26th. I left them unknowingly on one of the four real climbs that day – one moment I could see them together behind, then we climbed for 2 or 3 kilometres, and after that I couldn’t see them. I never thought for a moment Brian had gone to pieces and certainly didn’t expect they would be outside the time limit. The next day was the second of the three time trials – which I hate! On the first time trial (stage 6) there was a following wind on a sporting up-and-down course so it was not too bad. The second stage against the watch was the hill climb on the Puy de Dome which rises from the start at 1,323ft. to reach the summit, having climbed 3,346ft. in 12km. I didn’t mind it too much and from starting off number four, according to L’Equipe, I was ninth fastest 51 seconds down on Bahamontes after 25km. ; 12th at 45km. 1-39 down; 15th after 6.5km., 1-4 in arrears ; and then fourth fastest after 8.3km., 1 min. 33 sec. behind Bahamontes, with Gaul second and Anquetil third. At the finish I was 16th, 5-47 in arrears. But for an hour my time stood as best. The gear I used was too high – although one always thinks after an event that one could have done better although at the time you are going as fast as possible! Bahamontes and second fastest, Gaul, rode 48 x 26 gears of 49.8in. ; I had 48 x 25, which meant I pushed a gear of 51.84 inches. (I used the same bicycle throughout, but for the other stages I rode close ratio gears). The last time trial, the 21st stage from Seurre to Dijon, was by far the worst. It was 69km, into a strong head wind and Riviere, who really is a fantastic time trialist, won in 1-39-38. I finished last but one, 19 minutes 59 seconds down. But that last time trial came after the Alps. It was there that things really went well. Take .stage 17. That was over 197km. from St. Etienne to Grenoble and included several climbs – Col du Grand Bois (3,779ft.) and the Col de Romeyere (3,544ft.) being the main ones. The feed came 2km. from the foot of the Romeyere climb and Brian Robinson punctured. I waited for him – and got a sharp lesson in tactics from Brian for doing so ; I didn’t know that you’re not supposed to wait for anyone on a climb or a descent, as they can make up time then themselves. Still, I’ll remember next time! Anyway, at the actual foot of the climb on a narrow road there was a “stack up” which took some sorting out, but on the mountain I moved up from group to group until I found I’d caught the leading group which included Bobet and Anglade. Ahead were Bahamontes and Gaul having a big battle, and as I’d caught the leading group I just kept going. I got to within 50 metres or so of Gaul’s wheel, who was then chasing Bahamontes, and tried for 20km. to get right on! Later, other riders said they were disgusted with the Luxembourger who, they thought, should have eased to let me get on his wheel. As I was so far behind overall it would not have made any difference to him, but I suppose it was a question of his prestige being at stake. At the top of the Romeyere I was 1-7 down on Gaul; 20km. later at Villard de Lans I was 2-20 behind Gaul, who was by then with that other terrific pedaller, Bahamontes, and 1 min. 10 seconds ahead of the main bunch led by Riviere, Anquetil and Pauwels. When I saw it was no use trying any more, being just unable to close the gap, I eased, waited to be caught, and finished eventually in the bunch 15th, 3-42 down on stage winner Gaul. It was the first time I’d been on hills like that – in fact the first time I’d even seen the Tour de France. Stage 19 saw us on the St. Bernard climb of 8,160ft. soon after the start, which had the worst road surfaces imaginable. I lost ground on the descent – visibility through rain and mist was down to 15 yards, and the “road” was 2-in. deep mud! Just 57km. 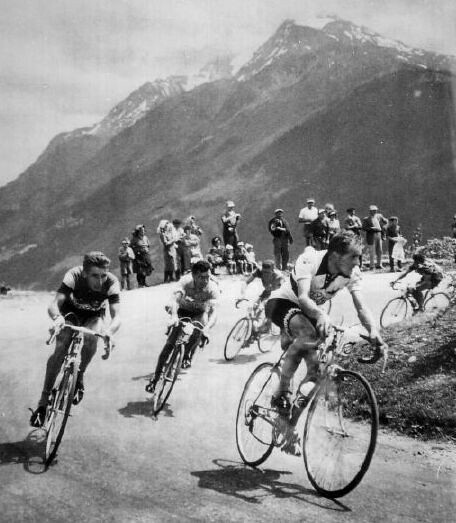 later, at the Farclaz climb, I was with Gaul, Bahamontes and Reitz, 2-35 down on Saint and Graf. By the finish, 134km. later, I was 9-22 behind Graf in 18th place. Now it’s all over everyone is asking me what I thought of the Tour… what was my greatest thrill… what I hope to gain by it… and so on. Well, it’s queer, but I have never been very envious of anybody – that’s why I came over to the Continent really. I remember the boys back home tried to discourage me, but I have always had confidence in myself, believing that one chap is as good as another. It’s self-confidence really. So I was not overawed by the occasion, although my greatest thrill was in coming off the top of the cols with Riviere, Baldini, Bobet and so on, and looking back to see all those other riders struggling behind! I had an open mind about the Tour when I started. The real aim was to do a good ride to try and be noticed and so possibly be signed up by a Continental sponsor. Everyone in Rheims, where I stay, was keen on me finishing the Tour, but I knew it would not mean anything just to finish-you can even lose by it, for if you’re not going well you don’t pick up the all-important prize money. Don’t forget the Tour is a race all on its own, and I think it is a race for climbers. I’m not big or strong, but I got there – not being fast on flat roads or a sprinter it’s a matter of hanging on to a wheel on the flat, a tactic well learned in Belgium where you can never drop a Belgian off your wheel. But in any case, it was more than three weeks’ free board and lodging! In the You Tube video above, look at 2 minutes and 21 seconds for Vic in action climbing with the best in the high mountains of the Tour de France.